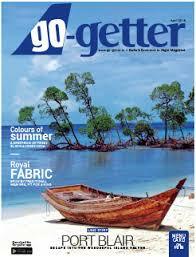 Go Getter is the exclusive In-flight magazine for Go Air. Go-Air is a budget airline which has been prevailing in the aviation industry since 2005. Go Air is an award winning national airline covering all important cities of India. It has recorded an industry-leading 90% occupancy. The content for Go-Getter covers all the topics for travelers like best food, stay, hang-outs, finance and investment, Automobile, entertainment, Team Management, current affairs, sports, health and fitness etc. Go Air route network: Ahmadabad, Bagdogra, Bangalore, Bhubaneswar, Chandigarh, Chennai, Cochin, Delhi, Goa, Guwahati, Hyderabad, Jaipur, Jammu, Kolkata, Leh, Lucknow, Mumbai, Nagpur, Patna, Port Blair, Pune, Ranchi & Srinagar. Exopic Media offers advertising solutions in Go Getter (Inflight Magazine of Go Air). For more details and advertisement related query, please write to us at info@exopicmedia.com, Or you may also call us at +91-7678237402.